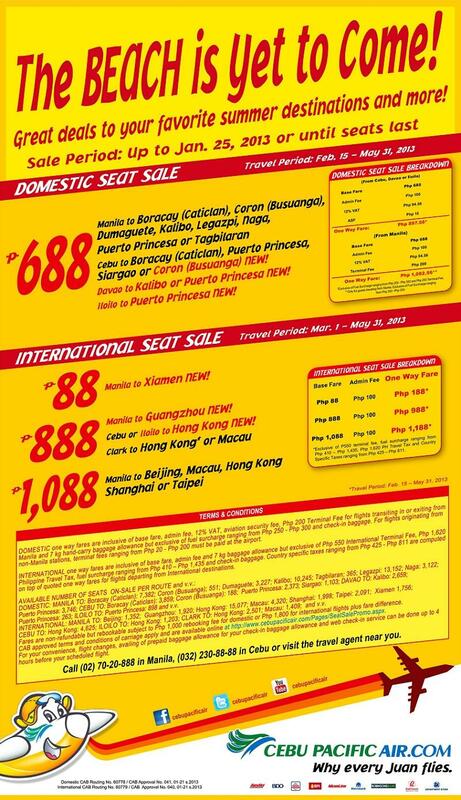 Budget airline Airphil Express announces a new seat sale promo! 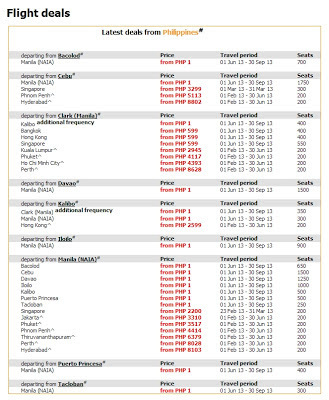 In their latest Web Sale and Express Sale, the budget arm of PAL is offering as low as 388 Pesos fare on selected destinations in the upcoming summer months of April 1 to June 30, 2013 (Express Sale) and February 15 to March 31, 2013 (Web Sale). Among the destinations included were Legazpi, Tuguegarao, Dumaguete, Tacloban and Roxas. There are many more destinations under this promo. For the complete list of routes as well as available seats per route, please check the link http://airphilexpress.com/Web-and-Express. The tickets can be purchased either online through www.airphilexpress.com or in their ticketing office. Aside from that, there is also an option to reserve a ticket and pay later via 7-Eleven, M Lhuillier or selected Petron branches. You must pay though within 24 hours or until the store closes the next day, whichever comes first. For further information about booking, please take a look at Airphil Express FAQ Page. Please take note that the fare figures here refers to "base" fare only. It is exclusive of taxes, fuel surcharge, baggage and other miscellaneous fees. Please be aware of them as you do your online booking. It would be good to check the final amount before pressing the final purchase button. Please be reminded as well of the terms and conditions of this promo. Promo fares are non-refundable, non-re-routable, non-rebookable. With that, be sure of the dates of your travel. Lastly, please be at the check-in counters at the airport 45 minutes before the estimated time of departure (ETD) or else, you may forfeit your ticket. For further information, please review the terms of service attached to your ticket. Do you want to receive free notifications from www.promophilippines.com regarding promo fares, mall sales, and other promotional activities? If you do, try any of the following. Low-cost airline Cebu Pacific offers a new set of promo fares for both domestic and international destinations. The seats were discounted to as low as 88 pesos base fare. The travel dates for this promo is from February 5 to April 3 for domestic destinations and March 15 to June 30, 2013 for international destinations. The domestic destinations included Clark, Cebu, Davao, Tacloban, Surigao, and many others. On the international, Brunei, Kota Kinabalu, Siem Reap, Bangkok and many others were included. Please refer to the promo poster below for more details. Tickets are sold online through www.cebupacificair.com and their ticketing office. The promo fares can be availed until February 3, 2013 only or until seats last, whichever comes first. You can call Cebu Pacific at these hotlines if you want further information: Manila (02) 70-20-888; Cebu (032) 230- 88-88. Please be aware that the prices displayed in the promo poster is only the base fare. It doesn't include the fuel surcharge, baggage, terminal fee, taxes, admin fee and other miscellaneous charges. The ticket that you will purchase can be far above the displayed prices. With that, before clicking for final purchase make sure to check the total cost of the ticket or examine the final breakdown. Please be reminded that if you are traveling locally, you are required to be at the airport counter at least 45 minutes before the estimated time of departure (ETD). For international flights, please be there 2 hours before ETD. Failure to do so can void your ticket as the terms of service says. Lastly, please review the terms and conditions document at the back of your tickets. It contains specific rules and information that will help you avoid hassle and other inconveniences. Cebu Pacific (PSE:CEB) is the largest local airline in the Philippines flying over 13 Million passengers last year. They currently serve in 33 domestic and 20 international destinations in 13 countries. The last addition to their expanding route is the daily flight to Dubai, UAE. 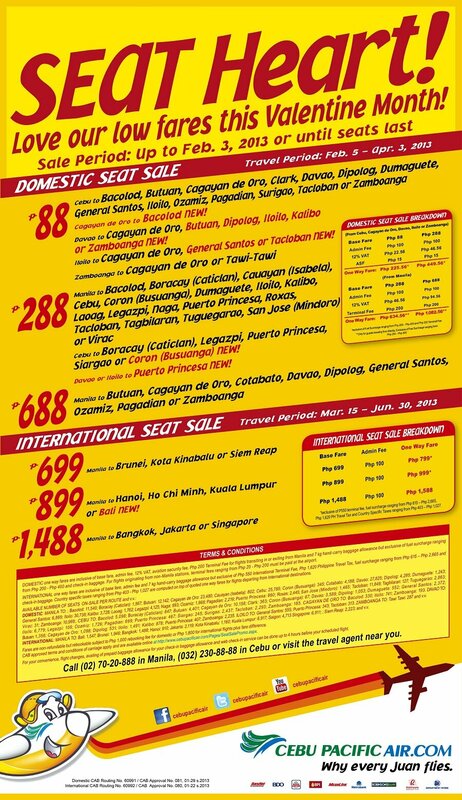 Tiger Airways - Seair announces today a Piso Fare promo! For as low as 1 Peso of base fare you can travel to selected Tiger Airways destinations. Including the taxes and other miscellaneous charges, your total fare will amount to just 200 - 300 Pesos per person without baggage and exclusive of terminal fee. The travel period for this promo is from June 1 to September 30, 2013. Tickets can be purchase online either through www.flyseair.com or www.tigerairways.com. You can also go to the nearest Tiger Aiways/Seair ticketing office. 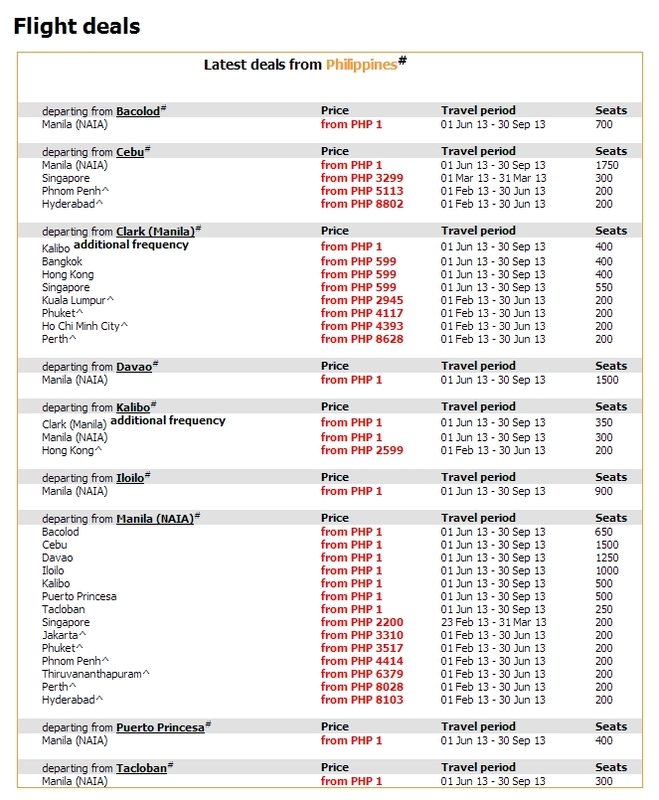 Booking of this promo fare is until February 1, 2013 only or until promo seats last. Please be reminded that promo fares are non-refundable, non-rebookable, non-reroutable, and non-transferrable. So, make sure of your travel schedule. You also have to be in the check-in counter at the airport at least 45 minutes before your estimated time of departure (ETD)or the airline may deny you of boarding because of failure to be there on the agreed time. Please review the accompanying Terms of Service (TOS) document in your tickets for specific details and instructions. The Philippines has many tourist destinations and some of them are included in this promo . For example, Puerto Princesa in Palawan is the site of a famous Underground River, which recently won an inclusion in the list of Seven Wonders of Nature. From Puerto Princesa, you can travel up North to El Nido or Coron, locations of the best beaches in the world (in my humble opinion). Kalibo also is included in the promo. It is the gateway to Boracay, probably the most famous tourist destination in the country. Tiger Airways is a Singapore-based low-cost airline company. It began its domestic operation in the Philippines in 2010 when it purchased 40% stake in South East Asian Airlines (SEAIR), a local airline company. The tandem currently operates in seven domestic destinations, coming from Manila and Clark. Low-cost airline Zest Airways announces a new seat sale promo that offers as low as 12 Pesos fare on selected domestic routes. The routes were to and from Manila that includes Kalibo, Busuanga, Legazpi, Marinduque, Puerto Princesa, Iloilo, Tagbilaran, Tacloban, Masbate, Cebu and Davao. The two Cebu routes to Davao and Puerto Princesa were also included. The travel period is from June 1 to August 31, 2013. Tickets can be purchased online at Zest Air's official website www.flyzest.com or through their ticketing office. The promo tickets are only available for booking until January 31, 2013 or until seats last, whichever comes first. Please take note that the 12 Pesos base fare is exclusive of the Fuel surcharge which amounts to up to 400 Pesos (depending on the route), Aviation security fee, baggage, taxes and other miscellaneous charges. Make sure to check the final amount before paying your ticket. Please be at the airline counter at the airport at least 45 minutes before the estimated departure time or else the airline may deny you of boarding. Also, the tickets sold in this promo offer is non-refundable, non-transferable and cannot be rescheduled. Lastly, make sure you bought enough baggage allowance during the booking to save money. Buying baggage allowance in the airport counter costs more than twice of the prepaid baggage. Budget carrier Cebu Pacific announces Tuesday a new seat sale promo offering as low as 12 Pesos base fare on all Philippine destinations. Currently, the Gokongwei -led airline flies to 32 domestic destinations. The travel period for this new promo spans from September 1 to November 30, 2013. If you are traveling on those dates, better check this offer. Please take note that the 12 pesos fare refers to the base fare only. It doesn't include the fuel surcharge which usually amounts to 200 to 400 pesos depending on your route, the Aviation Security Fee (ASF), the terminal fee which is 200 pesos in Manila Airports, the web admin fee which costs 100 pesos and other miscellaneous charges. Overall, your ticket will amount to around 800 Pesos on one-way without baggage. Tickets can be purchased online at www.cebupacificair.com or at their ticketing office. Promo tickets can only be purchased until January 31, 2013 or until all promo seats were sold. You can contact Cebu Pacific hotlines: (02)7020888 for Manila and (032)4116025 for Cebu. 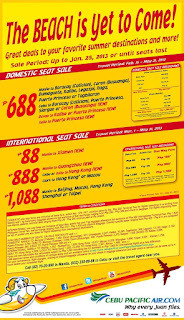 Cebu Pacific, the largest airline in the country in terms of number of passenger flown is giving out discounted fares to selected summer destinations for the upcoming months of February to May 2013. Some of the destinations included in this sale are Boracay (via Caticlan), Coron (via Busuanga), Puerto Princesa, and Tagbilaran. There's also international destinations such as Xiamen, mainland China and Hong Kong. 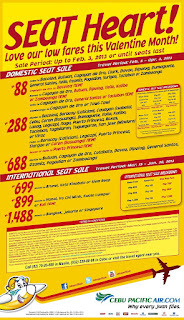 Please check the full details at Cebu Pacific's promo poster shown below. The summer season is fast approaching and to be able to spend less on your vacation, you need to plan ahead and buy plane tickets as early as you can. This latest promo from Cebu Pacific is a great opportunity to do so. Please take note that this promo is only available for booking until January 25 or until promo tickets last.Tickets can be processed online at www.cebupacificair.com or their ticketing office. Online booking requires credit card, or a debit card or any ATM approved for online transaction. If you are unsure whether your Card will work, please check with you Card provider. You can also call Cebu Pacific hotlines for more details. Their Manila Hotline is (02) 70-20-888 and their Cebu hotline is (032) 23- 88-88. Note: Base fare in the poster does not include baggage, terminal fee, fuel surcharge, taxes, web admin fee and other miscellaneous charges. Don't have any idea where to go for vacation? Check out Trip Ko Blog for a few suggestions. Traveling on the months of June to August this year? The largest airline in the country Cebu Pacific has a great offer for those who will. Today, the leading budget carrier announces a new seat sale promo slashing down their base fares to as low as 10 pesos. According to the announcement, promo is available on all 32 Philippine destinations. The promo entitled "DIEZ is it!" offers the 10-peso base fare for those traveling from June 1 to August 31, 2013. The tickets can be purchased starting today and will be available until January 23 or until seats last. It can be booked online at www.cebupacificair.com or via their ticketing office. Please take note that base fare does not include the fuel surcharge which can cost up to 400 pesos depending on the route as well as web admin fee, aviation security fee, baggage and other miscellaneous charges.